How Exciting to Receive Jesus for the first time! 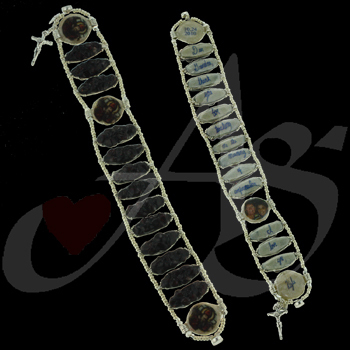 It is First Communion Season as well - enjoy this rosary bracelet for 1st Communion! 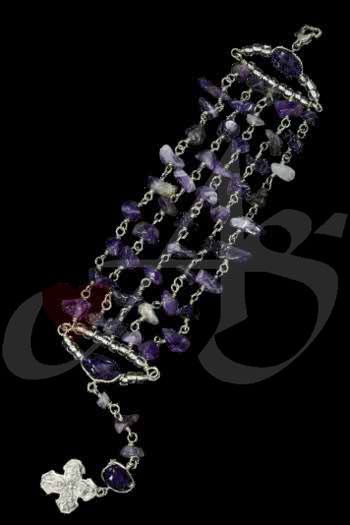 I remember making this First Communion bracelet for a little girl who loved purple (my kinda girl!!). I loved the image of the Blessed Mother on the reserve side of the Body Blood and Divine of Christ. I pray this little girl still uses her rosary bracelet. The Hail Mary beads are fiber glass and the Our Father end beads are amethyst with a hand wired heart clasp. Enjoy! Confirmation Rosary bracelet for a young woman initiated into the Catholic Faith, Enjoy! Another one of my go-to-designs that have been tweaked and improved over the years. 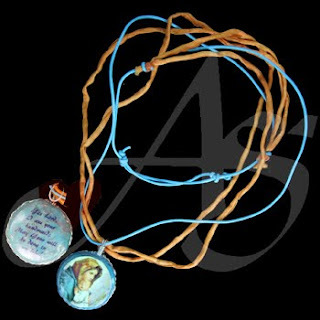 Here is the solution for a full rosary available at a moments notice since it sits on your wrist. Here we have used amethyst stones chained wired into five decades with a wired beaded bar leading into the Our Father beads. The sterling silver five way cross is one of my favorites. I really enjoy this design and have referenced it often... including a variation for myself which won an international award in 2015. Enjoy! Confirmation upon us I thought I would share some Ag gift ideas!! Sponsor rosary bracelet! Enjoy! This rosary bracelet was an awesome commission piece... I love working on stings... they are my favorite! This piece has hand made garnet beads, representing the confirmandi's birthstone, with images of the patron Saint, Confirmandi and Sponsor. On the backside of this beautiful piece is a letter from the student being confirmed to his grandmother, the Sponsor. Precious keepsake. 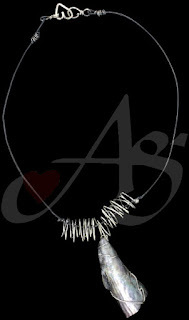 The metal is sterling silver with a magnetic clasp and safety catch. This bracelet design is one of my go-to designs... I a have a few... but this one is always classic. I remember the time well spent designing and creating the clustered garnet stones representing family always together either physically or prayerfully! Enjoy! St. Nicholas pray for us! OLMC - pray for us! Our Lady of Mt. 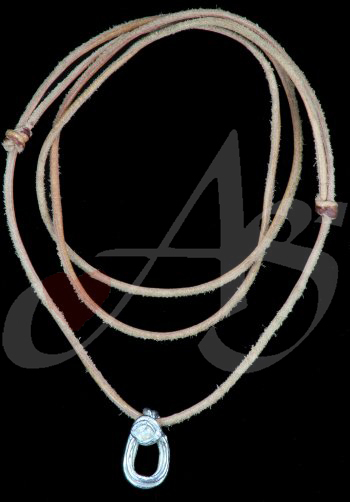 Carmel on Sterling Metal with leather cording. Enjoy! I remember the sweet lady who commissioned me for this piece. It was a pleasure to meet her... I was very excited with the outcome of this piece. I loved the picture and how it 'torn' onto the metal. I pray she still has an wears this piece. Enjoy! Sweet little hands help inspire this crystal necklace. Enjoy! My daughter liked all the sparkly pretty beads... that were small! She would get a design laid-out, begin the process and then say "I am tired Mommy, will you finish it?" Perhaps it was a mistake but I always helped her get to the end working together. When she got older I told her she needed to complete her pieces and that was the slow end to her hands on designing. She now gives her opinion and thoughts freely which I relish as well. But her little hands picked all the blue and clear crystals for Mary adorned with a sterling silver cross as well as hand twisted chain work near the clasp. Enjoy! Flash back - a piece my son designed when he was helping with creating the work. Enjoy! 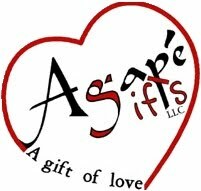 Agape Gifts started out as stress reliever; alone time for this, at that time, home school mommy! BUT God had a different plan... my little children wanted to spend MORE time with me even after spending the entire day working on school. SOOooo I humbly relented and let them "play" with the wire and stones... turned out to be a blessing. Meeting lots and lots of people as we traveled from shows both as a vendor and to vendors. My son learned about running a business and marketing... both learned creative outlet and designs. Both my children are very artistic, but very differently. Tomorrow and I will share a young design from my daughter. Enjoy! 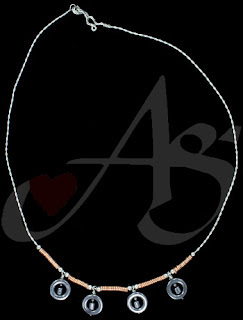 Diamond zircon set in Precious metal silver clay with an adjustable leather strap - good for casual or dress up! Enjoy! I saved my money to purchase a kiln... my first big investment. I was excited to use PMC or precious metal clay which back then was either silver or gold. This piece, as are all my pieces, are silver. When the price of silver sky rocketed I relinquished using this technique due to cost. Since then the industry has found ways to make metal clay out of bronze, copper and I think steel. I haven't exercised my knowledge in this area... I wondered over to sheet metal and have been dappling in that media ever since. Enjoy! 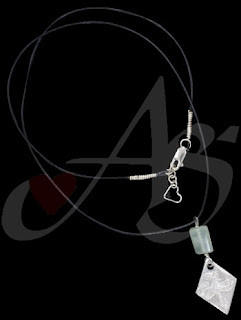 Fine Silver Metal Clay dragonfly hanging from a leather necklace and serpentine stone! Enjoy! I remember being so proud of this piece... I worked to get that silver all shiny showing off the texture of the dragonfly. I wanted to focus on the metal piece therefore using just a simple leather cording to hold it all in place with the aid of sterling silver wire! Now I try to make my pieces very dimensional and much more complex... but again it is good to remember less is more, sometimes. Simple is best - sometimes! Very simple organic design leather, sterling silver and a real shell from the shore! Enjoy! This is fun to see! An older piece I put together - very simple but nicely done. Its good for artists to go back and see their journey of design in the beginning -- which can inspire a remake with more enhanced skills. I like the simpleness of this piece... I remember that shell was an amazing blue gray with a wonderful sheen. Now I would probably remake the piece in textured metal... but I like the God created shell too! Enjoy! Mary is always holding us! 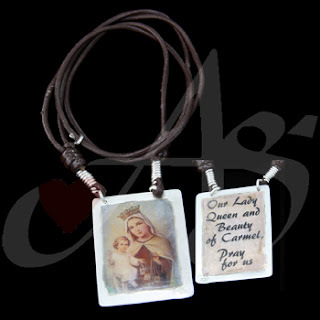 I just love Our Lady of the Streets - I believe that is the title of this image - I love the sleeping child reminding us that we should rest soundly on her shoulder knowing that she is wrapping her mantel around us. I like the way the polymer marbleizing around the words. The cording is a combination of leather and silk. Enjoy! A wonderful necklace that I like to "coin" as a chime necklace! Enjoy!! I vividly remember making this piece! It was in the summer and I was outside hammering, cutting and twisting away. This piece took hours to make with every metal piece carefully textured and sanded. I love the play of colors and tones. Quite a statement piece... it is fun to wear because it sings when you where it! Enjoy! My computer has been at the doctors for two weeks!! But we are slowly returning to the posting for the living!! I will be back shortly - perhaps next week! Please continue to pray for success... in this electronic world!